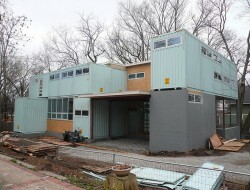 Take a typical suburban lot, five shipping containers, a determined woman and a willing architect and you get this stunning home. Most of the container fit-out was carried out off-site which allows work to progress quickly and with minimal waste. And while it may be radical compared to the other homes in the street, it is well within the range of ‘normal’ to fit into the local area. This container home is very low impact and features geothermal heating, soy plant foam insulation, passive solar heating and bamboo flooring. The home has a green roof and an edible lawn – planted out with herbs. Built in storage is a major feature of the home. The bathrooms and kitchen are fitted to a very high standard in line with the overall quality of the home. While the cost is not disclosed, the owner, industrial designer, Debbie Glassberg, believes quality container homes can be built for around $125 per square foot ($1,350 m2) which would make for a great value custom designed home. As a comparison, current custom build costs in Australia would be upwards of $1,500 m2 for a standard grade finish. A premium fit-out would add 15% to 25% to that figure. “You don’t have to pay a lot for great design; it’s available to anyone.” Accordingly, her container home incorporates all of her passions — solid, efficient, eco-friendly design, art, form and function, and a healthy way of eating. It’s a box-and-glass house with a decidedly global view of the world. There is also an interesting video walk-through of the home below the image gallery.